This 3-hour Horse Farm Tour may include a drive by world famous Calumet Farm with some history of what made this farm so famous back in the 1940”s and 1950”s and up until the present day. You will visit the famous Keeneland Race Course and take a walking tour of the lovely ivy covered old buildings. The morning tours get to see morning workouts. Keeneland was the home of the Breeder Cup Champion Races in 2015. After a visit to the track you will visit a couple of farms where you can get up and personal with the horses. In the Spring you will get to see broodmares and their new foals and see these new foals try to stand on those new long legs! Along the way you will see some locations where several movies have been filmed. Our Horse Farm Tour gives its guests a close-up look at the world's premier Thoroughbred horse farms. You can expect to spend approximately 3- hours with your tour guide visiting horse farms, Historic Keeneland Race Course and other attractions in the area. Every tour includes a drive by Calumet, two farms including a walk through one of the region's modern barns, plus a tour of Keeneland Race Course. Tours depart from several area hotels. We offer a complete and comfortable tour with knowledgeable guides. We strive to make your visit to the Horse Capital of the World a part of the great Thoroughbred tradition. We want to leave a lasting impression of this experience by taking you inside the plank fences and down the shady lanes of Central Kentucky. 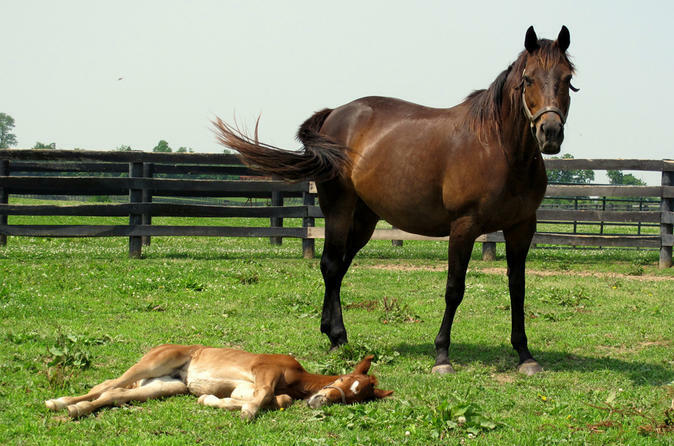 You will see horses after their racing careers are over, in-foal broodmares, weanlings, yearlings and depending upon the time of year, newborn foals. Our tour is unique in that we offer a glimpse into the daily procedures of working farms. You will have an opportunity to walk through the modern barns and you don't even have to clean a stall! Make sure you bring you camera as there will be plenty of photo opportunities.